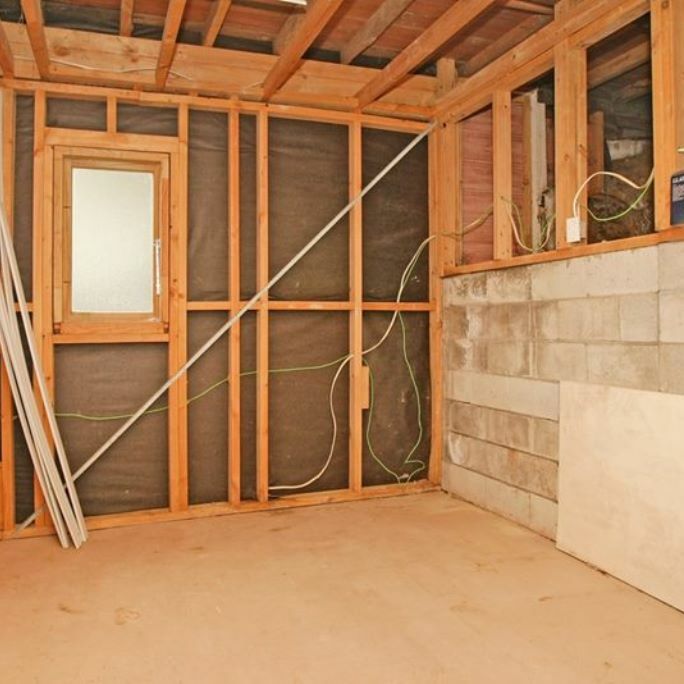 The previous owners had added the downstairs (in true Wellington style, by excavating) in the late 80s, but it had never been finished. The bedrooms at least had wall linings and paint and wallpaper, but the bathroom stayed as a shell until we moved in. I really want the new bathroom in place before the new baby comes - anything that makes life easier in the newborn phase is a win, not to mention that having a bath in the house will likely be a welcome addition in the last few weeks of pregnancy. So we have a good motivator at the moment - with less than three months to go it's definitely time to make things happen. Step one was getting channels cut into the concrete floor - although the room was intended to be a bathroom, and the drain had been added outside the external wall, no in floor plumbing had been allowed for. We outsourced that, because it is a messy, horrible job that requires special equipment. I think that was the right call, because the pros made short work of our awkward little job. Shout out to Allcutt Concrete Cutters - they were great to deal with and got the job done promptly. We did the digging part ourselves, to achieve the required depth for the drains - the Little Monkey enjoyed this job! Step two was ensuring the watertightness of the previously built block wall. We'd noticed during our pre-purchase inspections that there was some efflorescence on some of the blocks. The dirt had been a bit over-filled behind the wall, drainage outside was pretty poor which was directing water towards the house, and the wall itself had some gaps in it which hadn't been properly filled. So there was a heap of digging to remove some of the dirt; we're looking at several improvements to outside drainage to divert water away from the house; and we filled all the gaps in the wall and have painted on a rubberised membrane which should prevent moisture from being able to seep through. There was an obvious gap in the area with the efflorescence that looked to be the source of moisture, so having filled the hole and paid special attention to waterproofing that area we're pretty confident that there shouldn't be any further problems. We also (because: paranoia) chose to frame a new wall in front of the original block wall (sacrificing 150mm or so of the room) just in case. Belt and braces - but we'd rather be safe than sorry. And it also simplifies plumbing and lining the room so seemed the logical way to go. Step three was all the framing, which is fiddly but now complete. As well as building the new wall along one side we've added two wing walls. One is full height and gives us a luxuriously sized separate shower; the other is a half wall which conceals the toilet. The bath needed a frame, and then there were some missing ceiling dwangs and plenty of extra little bits and pieces to add to the walls to make sure we had niches for soap and strong fixings for towel rails and so on. In order to get plenty of storage - this is the family bathroom, after all - we added a cabinet above an in-wall cistern toilet, and we're using the same method there as we used for the kitchen cabinets so that it looks streamlined. That's a bit more framing - all up I think we used somewhere in the region of 130m of timber. Seems a crazy amount in such a tiny room but it adds up quickly! Dad's run all the plumbing, the sparky has been in to pre-wire, insulation has been put into the walls and ceiling, and we passed the plumbing pre-line inspection this morning. Now we're on to lining the ceiling and walls, and the drainage trenches will get filled later today. In another day or two it'll look more like a room than a dungeon. Winning! So that's been absorbing all our time and energy for the past few days, but hopefully by the end of this week we'll be able to hand over to the plasterers while we have a wee breather. Have you ever built or renovated a bathroom? Any last minute design considerations you think might help us out? The only thing I would say is as it's a family bathroom, get a really good extractor fan. My fan broke a couple of weeks ago (after under a year, grr) and it was awful until I could get an electrician in to replace it. I had on coming anyway to replace my broken boiler thermostat... Ah, home ownership, full of surprises! Oh yes, I forgot about shower domes. Do you find it drips unpleasantly? I've always wondered about that.